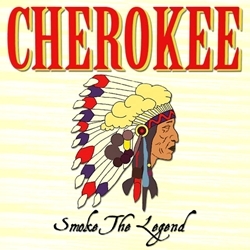 Cherokee Pipe Tobacco is a 100% natural high quality tobacco born from ancient recipes of Native American Indians. Cherokee Pipe Tobacco is ribbon cut and air cured, comprised of Virginia tobaccos grown to a state of ripened perfection, then harvest right before the leaves turned super smooth. Each blend of this premium tobacco has a full-bodied flavor that burns slowly and consistently giving no harshness, allowing for a milder smoking experience. Cherokee Pipe Tobacco is value-priced that’s perfect for smokers who like using this premium tobacco smoked straight from a pipe. Cherokee Pipe Tobacco is manufacture and distributed nationwide by Native American owned Cherokee Tobacco Company LLC, South Boston, VA USA. Cherokee Pipe Tobacco is available at our online tobacco store in unique styles to choose from. Mellow, Menthol, and Original. Switching to a smoke like Cherokee Pipe Tobacco is a great alternative to expensive and over-priced retail brands. Here at Smokers Discounts we’ve made it easy and affordable to buy pipe tobacco online. Call us for more details!